We stipulated: We were at the Americana on a Friday night for an event at the Barnes & Noble, and it was getting late -- too late to find a sit-down restaurant, but time to get something quick. 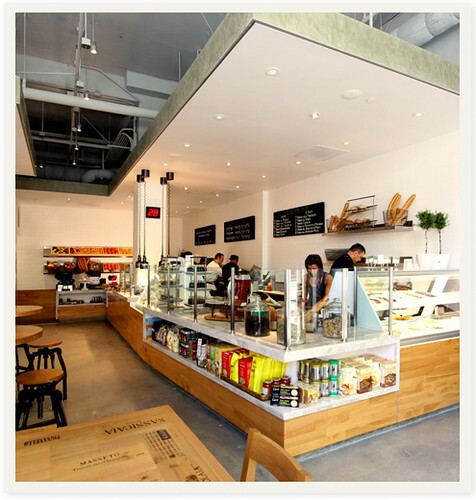 They stipulated: "Deluca’s Italian Deli serves up flavorful, authentic sandwiches, antipasti and bakery treats in a fresh, modern setting. Enjoy Italy’s finest imported meats and cheeses as well as local artisanal specialties, all priced for everyday eating." High point: The one sandwich was good enough for both Maria and I (we weren't that hungry), while Evan and Nathan could share the pasta. 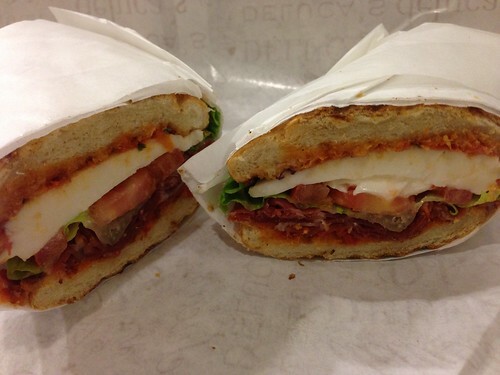 Low point: They gave us the wrong sandwich first -- mozzarella with prosciutto. 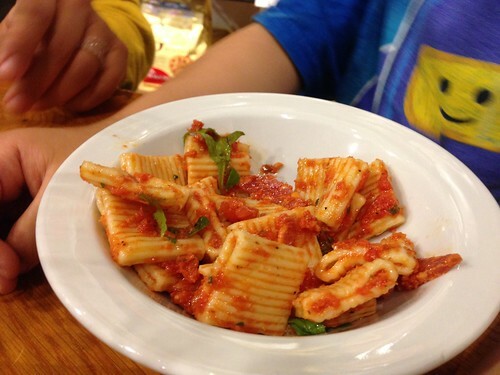 It was Friday, so we were supposed to be no-meat for Lent, and realized Deluca's error when we took a bite! But thankfully they made us a new sandwich and let us keep the wrong one (and bring home). Overall impression: While the market items (imported from Italy) are as pricey as you might expect, I was impressed with how economical our meal was -- rare for an upscale deli like this. 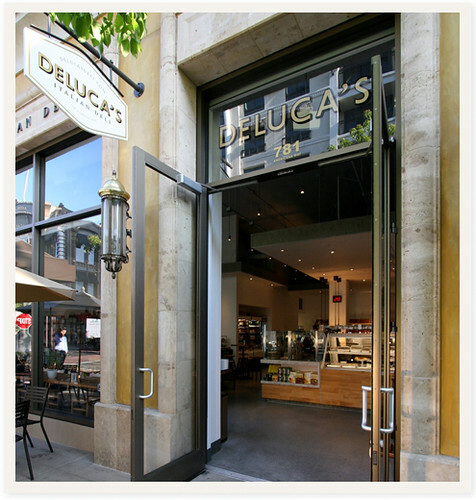 I like that Deluca's is around, and is probably a nice resource for people living at the Americana. 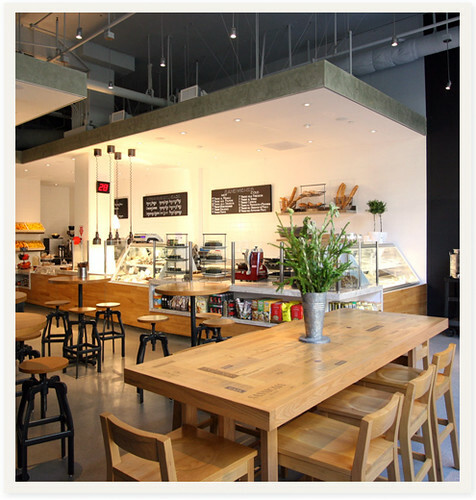 Given the Americana's turnover rate -- many of the shopping center's inaugural restaurants (including the ones funded with Rick Caruso seed money) are now gone -- I wonder how long Deluca's has left in its life. But for now, I'm glad we tried it. 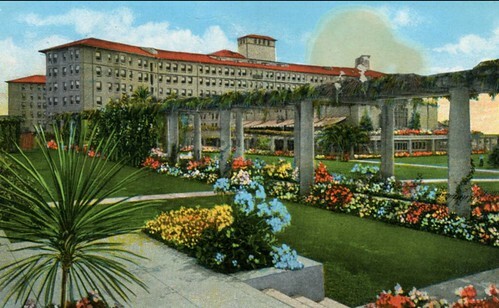 Will we return: Perhaps, if we're at the Americana and again looking for a quick bite to eat.